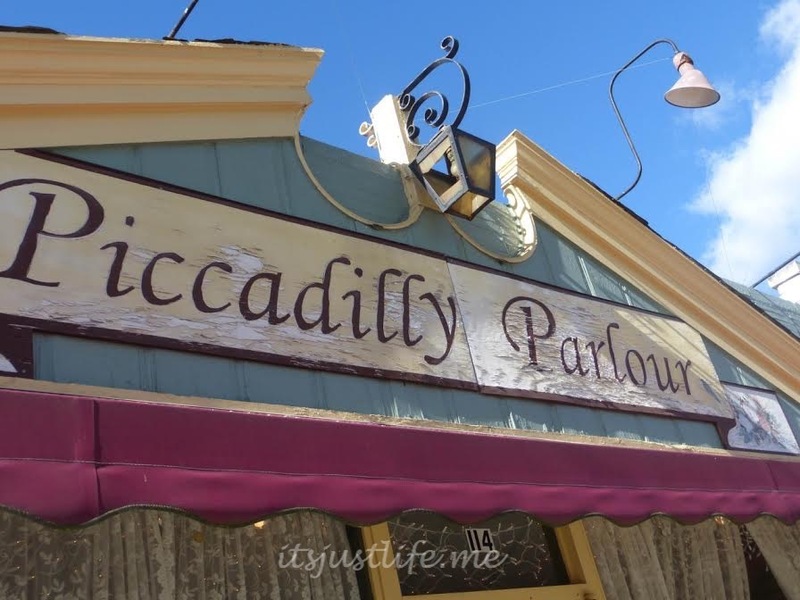 Teatime at Piccadilly Parlour Victorian Tearoom in Canfield, Ohio is always a a fun event and I have had the chance to visit this great little Victorian tearoom twice with my sister and mom. Last November we stopping in to celebrate my mom’s 86th birthday and even though I ordered the same item I had ordered on my first visit I loved every single morsel of it. 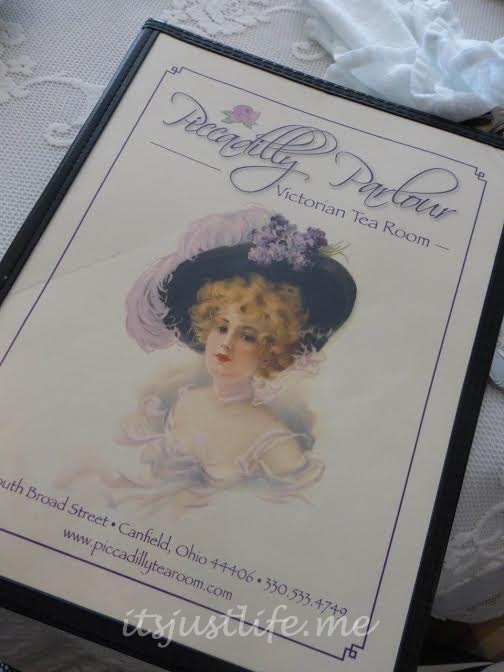 Piccadilly Parlour Victorian Tearoom is located at 114 S. Broad Street in Canfield, Ohio which is a small town in Mahoning County close to Youngstown and I love finding places like this in cute little towns. I am almost never disappointed in places like this because they are often the place that the town locals gather and support. The decor is just as you would expect it to be. 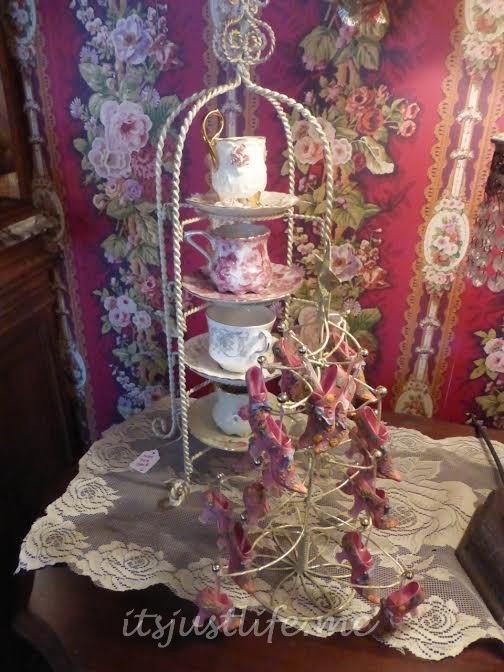 It is tastefully decorated with Victorian decor and did I mention that there are a lot of things for sale? 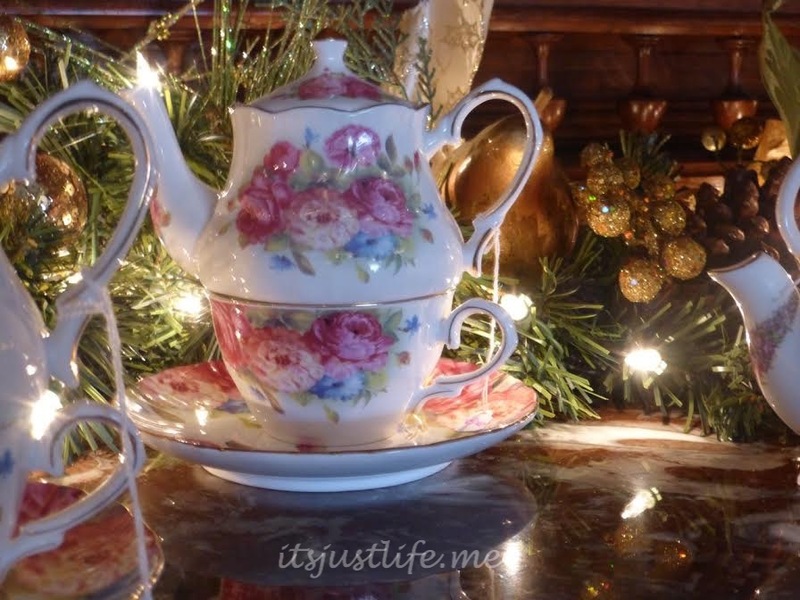 From tea pots and tea cups to soaps and other gift items the selections available for purchase are varied and plentiful. 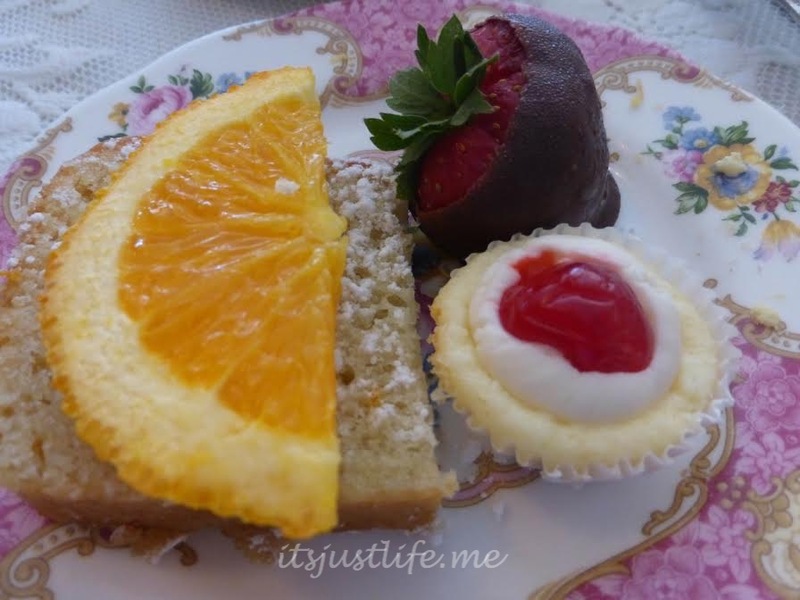 The menu is a fun selection of different teas and the food offerings include salads to quiches to my favorite tea sandwiches and tiny desserts served on the adorable tiered tea trays. Who can turn down any of these delightful looking treats? 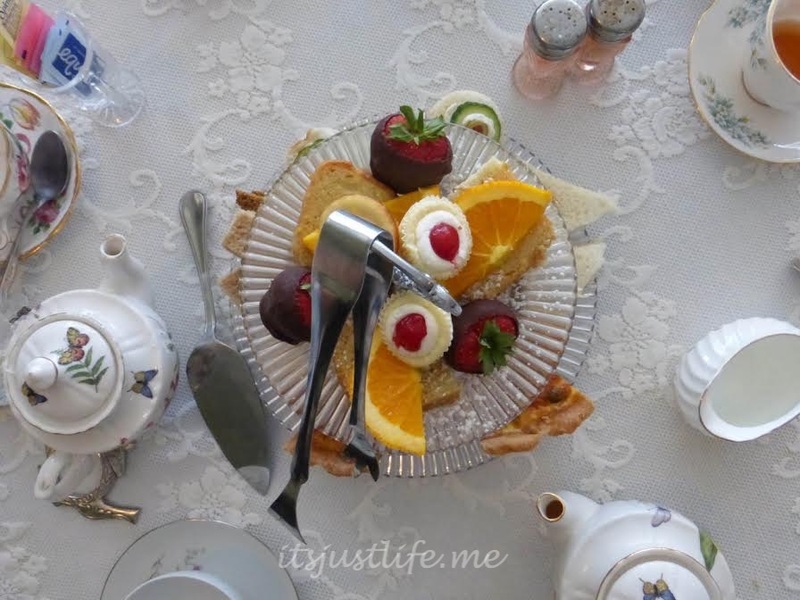 My selection for afternoon tea contained an assortment of miniature tea sandwiches and desserts. 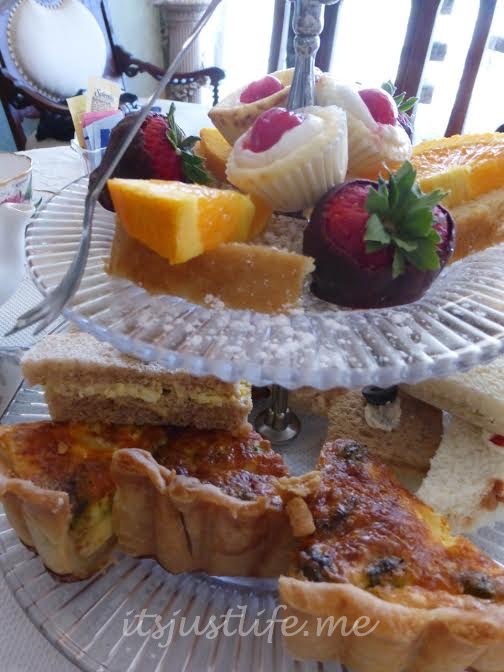 Selections included traditional cucumber sandwiches, walnut cream cheese wedges, egg and chive, chicken salad sandwiches, tuna salad, quiche slivers, and delightful sweets. This is also served with a cup of soup and of course a pot of tea or other beverage. 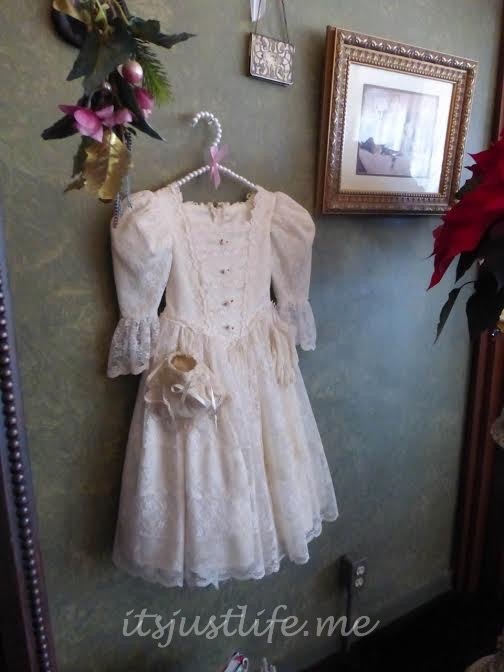 There is even a children’s menu and an area of clothes and hats that you can try on and wear during your visit. 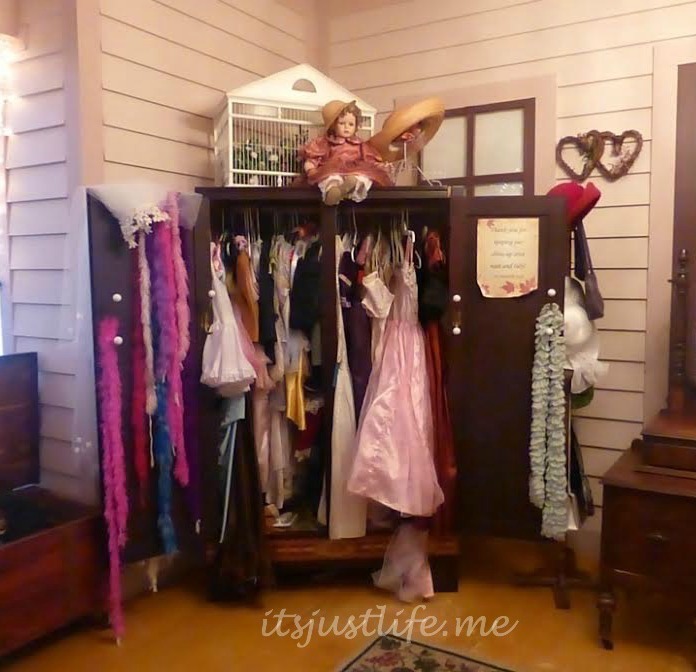 Can’t you just see bringing a group of little girls here for a dress up party? I love that there is a “no hurry” atmosphere here and both times I have visited there was no sense of being rushed to finish and we lingered over our tea and meal. It was the perfect lunch with perfect company. Of course the tea pulled me in but it was the company that was the best part of this day. Do you have anyplace like this in the town where you live? What is your favorite thing about local places like this that provide a different dining experience? Don’t forget to Comment for a Cause. This tea house looks delightful. I have never gone to one before and really want to. Is there one near your house too? I haven’t found one yet but I haven’t really looked. Let the looking begin! I will take you when you come visit! I love that this tea house has dress-up clothes. What a splendid idea. Randy and I once dined in a tea room. He felt quite out of place. 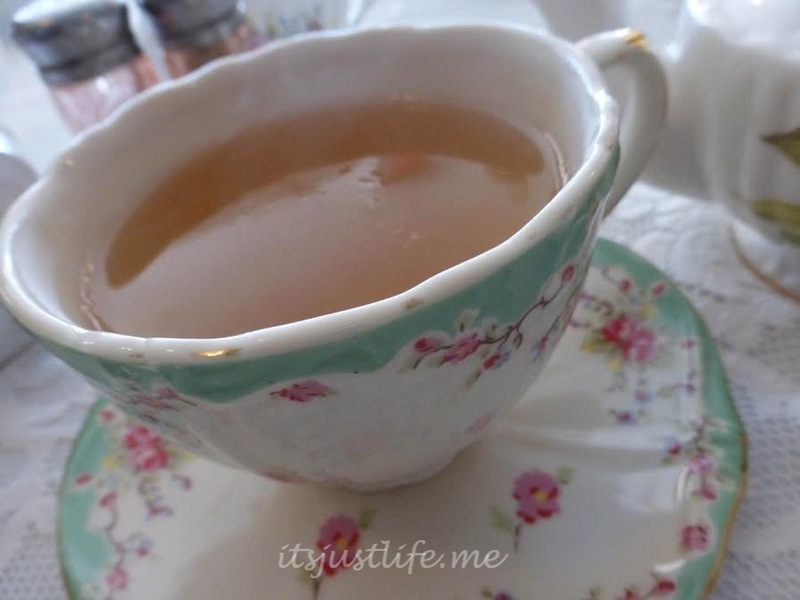 I felt bad since I’d never been in a tea room prior and really did not understand that this is primarily for women. Oh Chris has gone with me to several tea rooms and fit right in! Maybe it was a different kind of tea room? They are often predominantly women filled but still fun places for men to experience if they like tea and yummy little sandwiches! How fun! 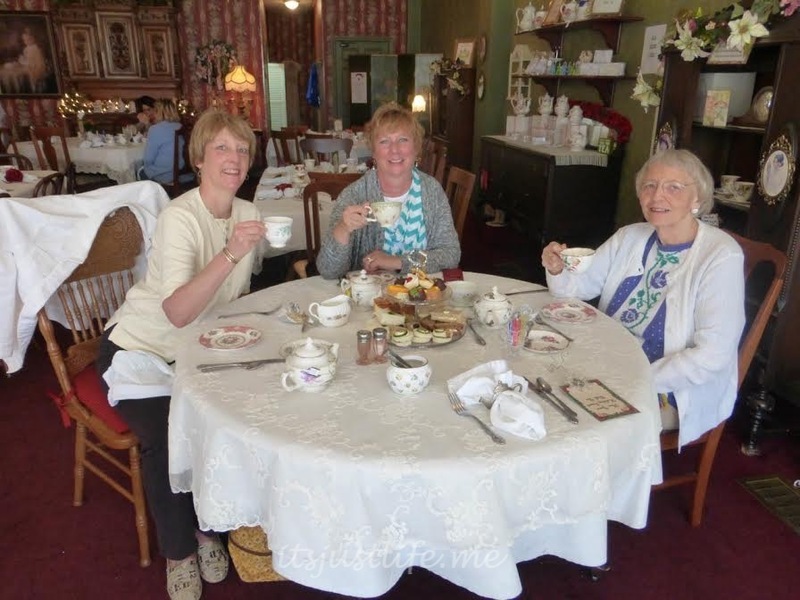 I haven’t been to a tearoom in decades! There actually used to be one in Latimer of all places!! The Decker house also serves tea sometimes but I never made it there. There was a place in Clear Lake I went to a couple of times but not sure if it is still there. The walnut cream cheese wedge sounds wonderful! 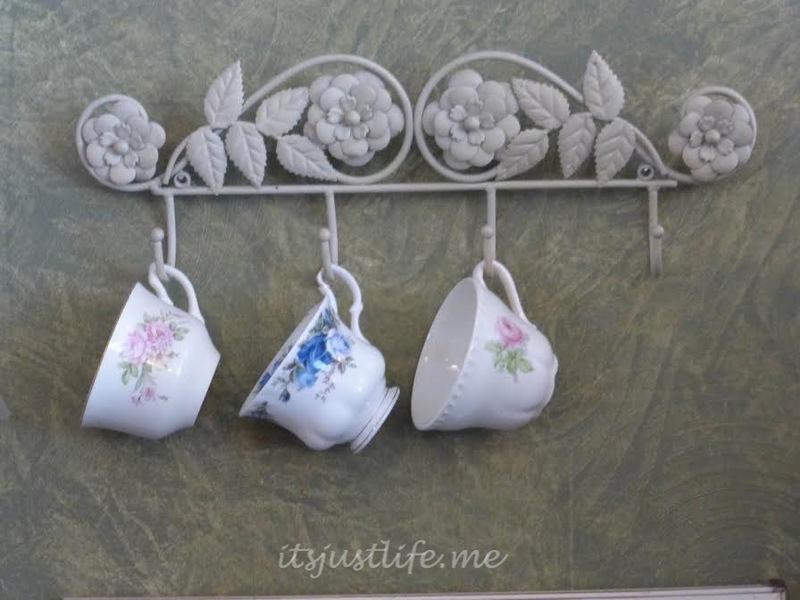 Too bad you travel all the time – you could open a tea place like this in our town! It would be fun to have a place like this but I am afraid I would drink all the tea and eat all the sandwiches. I am going to do this for you and Lali sometime! You could go with me. 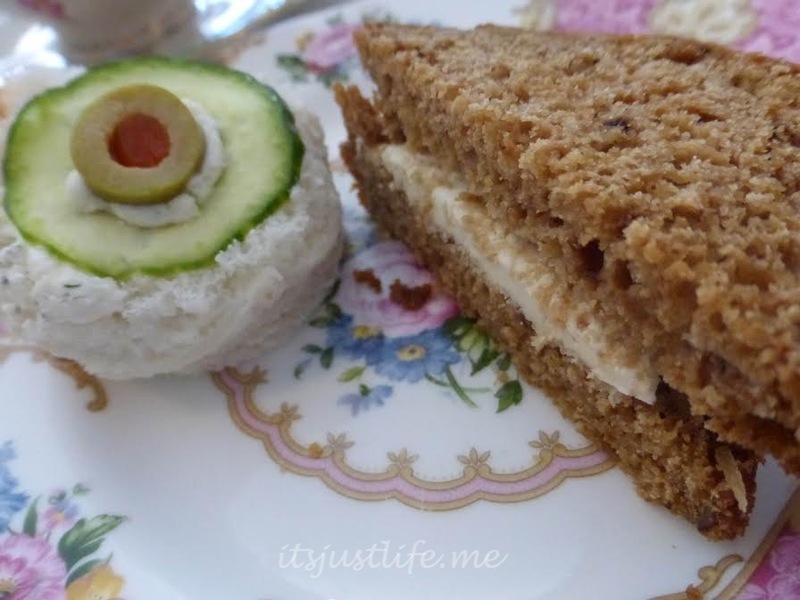 The finger sammmies were lovely and it makes me want to have a tea party at home! Just my kind of place. In Vancouver is a place called The Secret Garden which is similar. I had my birthday party there a couple of years ago. It was smashing! The three of you look like you are having a wonderful time. A perfect place to take your mom. I love places like this and they seem to be everywhere if you just look for them. There is always something fun about the decor and the food was yummy.